This post is a writeup of the Pwtent Pwnable 200 Challenge in Defcon 2010 CTF Quals. Running on pwn8.ddtek.biz. And this file was given. 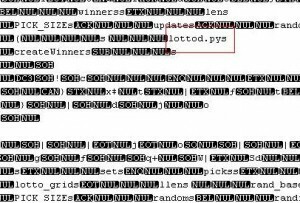 Note that there are references to lottod.pys file which indicates that this could be a python script file. Sure enough, if you decompile it using decompyle you get the following source. If you notice, this indicates that the server is running on port 10024 and indeed it was on pwn8.ddtek.biz. If you read through the code you also see that the source port number is being used as a seed to the pseudo-random number generator (PRNG). So I fired up netcat to see if indeed that was the case and sure enough no matter how many times I fired up the command the options I’d see would always be the same. 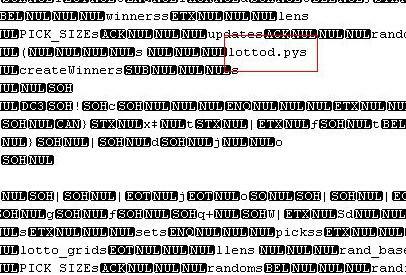 But then you also see that the first element of the self.lotto_grid list is a function pointer. Also, you notice that there’s an eval() function that essentially executed the checkWinners function. So I wrote up the following python script that would go through all possible combinations of ports and index values to overwrite so that I could overwrite the self.lotto_grid value because that’d give me control of the execution flow. print "Sorry you aren't very lucky... Maybe you have better luck with women?\n"
Once you run this you get the following values for port and index: 28741 & -5 respectively. Welcome to lottod good luck! Thanks for your choices, calculating if you won...ZOMG You won!!! And that is indeed the answer to the challenge! The python file is located here: Pp200sol.py. I wanted to use variables in a bash script’s for loop inside awk’s print statement. Here’s an easy way to do it – enclose the bash variable within "’"
I came across the interesting Skype4Com API that could aid users to dial several numbers using skype. Upon executing this you can use the Skype4Com API using .Net (C#, VB Script) and even Python. One can even generate DTMF tones to dial in to 1-800-numbers and automate the process so you can directly get through the initial wait times and directly speak to the customer representative. So we were capturing packets but the packit tool did not randomize the source IPs enough so we were getting decent signatures for TCP traffic but not for ICMP! So looking at the signature generation I found that the checksum was also being used to get the hash value. But, when I stopped using the checksum values for generation of hash the signatures started coming properly. Antoine, somehow, thought that the IP addresses were affecting the has values that we got. But looking deeply into the code we saw that it was not the case. The conclusion (which is really surprising) is that packit was generating similar packets quite a few packets and that too from the same source IP (but they really should have been randomized! )…I don’t know whether this conclusion is correct??? May be some packit developers would be able to help me on this! So now the challenge becomes to send those ICMP signatures across…but icmp_send() method requires skbuff structure…I looked at the net/ipv4/ipip.c file for the usage of icmp_send() methods but it is still not clear to me how it should be used! Yesterday was a fantastic day trying to get the IP data field to be pointed to by in the skbuff structure. The documentation in the files did not help make things clearer. unsigned char* data field in the skbuff structure to point to the IP data starting point. I think this actually grabs the gist of what I exactly want to do. I *really* want to point with respect to the IP Header. I do not really care about where sb->data really points to so I guess Vinay’s method is much better. Haven’t implemented it so I really don’t know but sounds the most logical!